Anyone for some Haggis Sandwich? - Kapiti Playhouse Inc. Anyone for some Haggis Sandwich? Coming up on July 24th, Kapiti Playhouse once again plays host to Andrew London & Steve McDonald as Haggis Sandwich. The concert, which begins at 7.30pm, costs just $25 with tickets available at Coastlands TicketDirect information desk. Door sales may also be available depending, obviously, on ticket sales. “How could this work?” was the question that musicians Andrew London and Steve McDonald asked each other when it was suggested they collaborate on a two-man show to tour the country for the Arts On Tour NZ Trust in 2013. Andrew London’s satirical and engaging songs have been the mainstay of popular trio Hot Club Sandwich and Kapiti 5-piece country band The Cattlestops for the last decade. His recent solo album Middle Class White Boy Blues was reviewed in Downbeat USA, one of the world’s most respected music journals. Reviewers have compared his lyrics to Tom Lehrer, Dave Frishberg, Mose Allison, even Noel Coward. Recent song titles Steve McDonald & Andrew London betray the humorous nature of his lyrics: ‘I Hugged My Mate’, ‘Country’s Buggered’ and ‘I Think I’ll Buy a Yacht’. Steve McDonald’s brand of original Celtic-flavoured music inspires a flood of patriotic nostalgia wherever he goes, based as it is on the history of Scotland, various run-ins with the English, the legendary ‘clearances’ and the Scottish diaspora to Canada, Australia and New Zealand. Having sold over three million albums in the USA alone, and touring there regularly, Steve now lives on the Kapiti Coast and plays regularly around the country. His epic Celtic-rock versions of anthems ‘Loch Lomond’, ‘Scotland The Brave’ and ‘Flower of Scotland’ elicit frenzied waves of Scottish nationalistic fervour wherever he goes. During a hugely successful six-week national tour in 2013, in which they played everywhere from Stewart island to the Hokianga, it became obvious this was a natural match-up, with capacity audiences at most venues clamouring for more. These two instinctive storytellers provide a wide-angle view of Kiwi Culture; where some of it came from, where it is now, and some of the everyday issues that consume and confuse most of us, viewed with a kindly but slightly curmudgeonly irreverence. With some new songs (and jokes!) 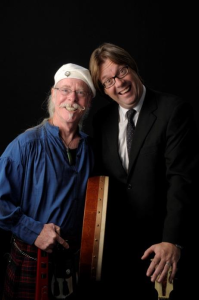 McDonald and London bring the Haggis Sandwich back to the Kapiti Playhouse on 24 July.